Yeah Baby! 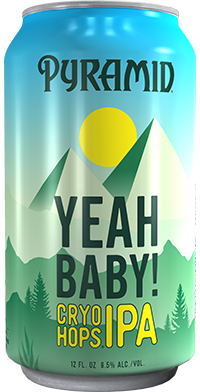 | Pyramid Brewing Co.
Relive those “Oh Yeah!” moments with a beer as exciting and inspiring as a breathtaking mountain vista. This orangish-hued IPA starts with a silky smooth malt body easing into lush forest of juicy tropical hop flavors and aromas from the late-addition Denali hops and Amarillo and Calypso dry-hopping. We then finish the trip with a flavorful blast of tropical berry from Ekuanot® CRYO-HOPS®. CRYO Hops are the concentrated lupulin of whole-leaf hops containing resins and aromatic oils. It is designed to provide intense hop flavor and aroma.